A drink-driver who fled from the scene of a crash has been banned from the road and been given a community order with unpaid work. Chesterfield magistrates’ court heard on September 13 how Darren Samson, 30, of Chesterfield Road, Tibshelf, lost control of his works van and collided into a parked Landrover Discovery which collided into a parked Citroen Saxo on High Street, at Tibshelf. Prosecuting solicitor Emma Price said: “The defendant drove to the Twisted Oak, at Tibshelf, at about 5.30pm using a works vans and at 11.30pm he drove down High Street. Witnesses stated that they had seen the defendant running along High Street, on August 23, away from the Vauxhall Combo van and they alerted police who revealed how they found him hiding with blood on his face. 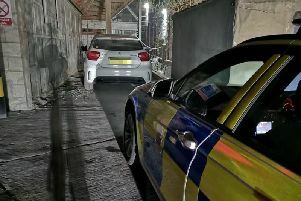 Samson told police he had driven from the pub using a works van after drinking gin and lemonade throughout the evening. He added that he remembered driving the van and being found by police but he could not recall the crash. Samson, who has previous convictions, pleaded guilty to exceeding the alcohol drink-drive limit and also admitted failing to stop after an accident. The court heard that Samson registered 82 microgrammes of alcohol in 100 millilitres of breath when the legal limit is 35 microgrammes. Defence solicitor Pamela Coxon said: “This defendant travelled to his local pub in his works van which is a mile from his address and he intended to walk home. “He had received bad news about his father getting news about a serious illness. Samson was sentenced to a 12 month community order with a Rehabilitation Activity Requirement and 80 hours of unpaid work. He was disqualified from driving for 22 months and must pay an £85 victim surcharge and £85 costs.